In 1846, Lizzie Poole and her brother, Tom, escape England for Australia. Lizzie is escaping an inappropriate romantic relationship, and Tom is escaping a murder charge, from duelling to defend his sister. In Australia they meet Edward Thornborough and his wife Ria—who is the spitting image of Lizzie.Five years later, Lizzie Poole is back in London, masquerading as the widowed Victoria Thornborough, hoping to reconcile with Lady Thornborough, Ria’s grandmother on her behalf, and hoping to find the letters that will prove she is half-sister to Ria. But Lizzie hasn’t counted on falling for Geoffrey, Lord Thornborough, Ria’s brother-in-law and a man Ria is forbidden by law to marry. If she were to reclaim her true identity as Lizzie, she would be free to develop a relationship with Geoffrey, except for her unfortunate history with Freddie Highfield—a history that Geoffrey, an ex-vicar and committed Christian, is unlikely to be able to forgive. Things get even more complicated when she is recognised as Lizzie Poole by a face from her past …An Heiress at Heart was set mostly in Victorian London, and the author appears to have researched the time and location well, particularly around conveying the attitudes and manners of the time. I found both Geoffrey and Lizzie/Ria to be highly likeable characters, and spent most of the novel wondering how they were going to be able to overcome their (assumed) formal relationship. 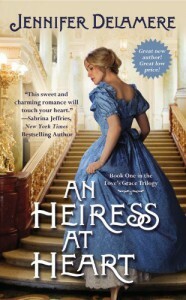 As it happens, I think the author managed this very well.An Heiress at Heart has been nominated for the 2013 RITA Awards for Inspirational Fiction. Will it win? It’s hard to say. The other finalists include a variety of long and short historical and contemporary novels. I’ve only read one other finalist in the Inspirational category, a contemporary novel that is quite different in style but equally good. There is also a twist at the end which sets the story up nicely for a sequel.While this is a Christian novel, the faith elements were understated and not at all preachy. Recommended for Regency Romance fans (even though this is Victorian), and fans of authors like Kaye Dacus. Thanks to the author for providing a free ebook for review.